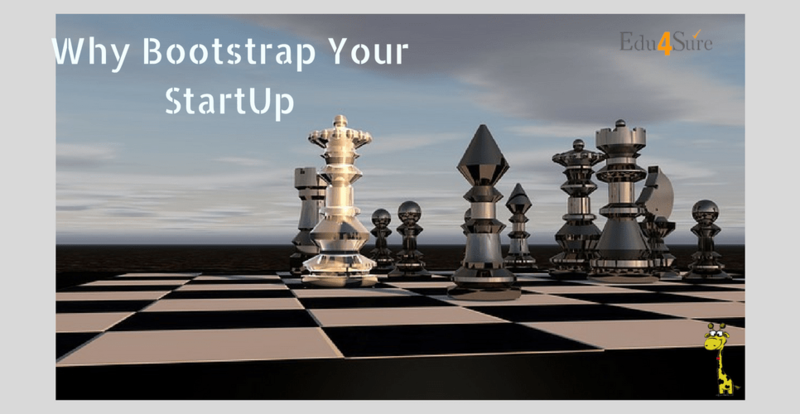 Home Entrepreneurship Why Bootstrap Your StartUp? Jeff Bezos, CEO & Founder of Amazon.com rightly says that “ONE OF THE ONLY WAYS TO GET OUT OF A TIGHT BOX IS TO INVENT YOUR WAY OUT”, and this is what is Startups, ‘All about a newly emerged entrepreneurial venture’. These companies are majorly involved in innovative ideas and processes. Our honorable PM Mr. Narendra Modi firmly believes that “Startups technology and innovation can be exciting and effective instruments for India’s transformation’’. Several big companies are start-ups of yesterday due to hard work and perseverance have become shining beacons of innovation today. Venture capital funds are investment funds that manage money from investors for start-ups, small and medium-sized enterprises. Bootstrapping means starting a business from scratch and building it up with minimum outside investments. Start-ups with venture capital may have strong growth potential. But being newly founded it is not necessary for a startup to be venture funded. PM Modi once stated, “Success of entrepreneurs depends on their ability to take the risk”. Surely we have a slow and steady growth by bootstrapping our business but on the contrary, we enjoy its flexibility and independence too. Having your company bootstrapped gives you the luxury of freedom in thousands of ways. I do not say that we don’t enjoy freedom when we get investments from an outsider but it is just not the same. Another keen observation I made was that founders indulge so much of their time in meeting and planning with angel investors, venture capitalists and others just to raise money. During this time they should be improvising their products. Funded businesses are forced by the investors so grows as fast as a launching rocket whereas bootstrapped businesses are engines of exponential growth. Business styles bootstraps follow are conventional. Step by step methodologies is used. It is good for a startup not being contemporary. Preferably we should go bootstrapped because decision making becomes easy whether it is a startup or a large scale business. Best is in bootstrapped because of selected profiteers comparatively than funded business. Bootstrapping gives us a clear vision. I favor bootstrapping as it gives us control over direction and timings. Unless there is an absolute need for us to bring our product to market there is no need for venture capital funding. Bootstrapping is of real practical value. They have no alternatives but offer independence. Basically, building a business out of very little or virtually nothing is what bootstrapped business all about. They usually rely on personal savings and incomes. Many of today’s largest corporations for example (Apple computers, coloron co, Coca-Cola, Dell computers, Hewlett- Packard, Microsoft) began as startup ventures. It is really quite heavy of a question as to what is better and why, as if bootstrapping is better than funding through venture capital then why? Here I have laid a few significant key features. 1. FOCUSSED OVER REVENUE: As an entrepreneur when we are bootstrapping we need to have a laser-like focus on creating value product for our customers. Raising funds through venture capitalists etc is lucrative and easy but for raising funds one has to spend a huge amount of time with their investors which eventually is a waste. Bootstrapping influences our decision-making and allows entrepreneurs to worth their time, energy and of course money. 2. ABSOLUTE VISION: Successful entrepreneurs have a clear vision of what they want their company to be. To work on something that truly interests us is an amazing feeling. With each additional shareholder someone else’s vision, motivation and purpose are absorbed and adopted thus bootstrapping is a better option. 3. CREATIVE FREEDOM: Bootstrapped companies are more effective at making constant course corrections, carefully honing the business model to be sharper and sharper, and ultimately constructing a strong foundation for consistent, sustainable growth. We as sole investors and proprietors of our business and can bring any sort of alterations in the final product for end users. 4. VALUE OF MONEY: We learn to value money faster because it is we who invests and has to enjoy success or bear loss. Since we don’t have an excess of money when bootstrapping our business, we tend to spend wisely and learn to manage our company’s money more efficiently. Learning this type of financial discipline can be beneficial in the future, even when our company finally gains excess capital. 5. SOLE-PROFITEER: The owner gets to take home a bigger piece of the pie in the event of a company exit instead of having to share it with investors. Sole trader or proprietor invests alone so it becomes obvious for him to enjoy the profit made alone. Thus to bootstrap, the business is a better and wise decision. 6. BETTER LEARNING: Bootstrapping is never easy nor very glamorous but it will surely make us a better and much stronger as an entrepreneur. With small capital investments, we can learn our assumptions carefully. Along with it, we can learn about our product, markets, and customers more intimately. And if we make mistakes as all entrepreneurs do they will almost certainly be smaller in scale. Meanwhile, you will learn to become a scrappier, more vigilant founder. 7. BETTER PRODUCTS: There won’t be much of investors in a bootstrapped business so quick decisions for enhancing product ideas and planning your go-to-market strategies and more will be increased. Another advantage of a limited budget is a greater focus on our products and services. The pressure of a shorter runway will force us to get our products right. When every last rupee matters, we need to pay attention to our customers and their needs by building a superior offering. That insight and dedication will increase the likelihood of generating revenue and building a brand more quickly. 8. EFFICIENT MANAGEMENT: Being the only investor with less number of full-time employees and a handful of interns it becomes important to manage efficiently and wisely. We learn to be so efficient not only in managing but also in spending every single pie. Usually, for a bootstrapping startup, it’s spending on things that improve the product and customer experience. Efficient management can be learned from bootstrapped start-ups. It can only make you and your startup better. Hence, the above-stated ones were the advantages of bootstrapped start-ups. As our honorable Prime Minister, Mr. Narendra Modi said while putting forth a plan for start-ups in India, “Hindustan Mein Aisa Koi Zila Na Ho, Aisa Block Na Ho, Jahan Koi Startup Na Shuru Ho, STARTUP INDIA”. Therefore every startup cannot be funded through an outer source and angel investors thus we also need to take a little risk of generating higher profits by bootstrapping our business. I would say that, BE NIMBLE AS A CAT AND BUILD LIKE THE ANTS. Start your journey with a single motivated step being bootstrapped. Previous articleHow To Set Up An Incubation Centre? Next articleWhat Is & How To Be A Singer? Freeda is passionate about start-up! She is a management professional and wants to have own ventutre in future.